Via outsourcing -- as in, finding others to do the work while you oversee/manage day-to-day operations. This guide tells you everything you need to know to hire RELIABLE help that can help you earn 6 figures your 1st or 2nd year as a freelancer. 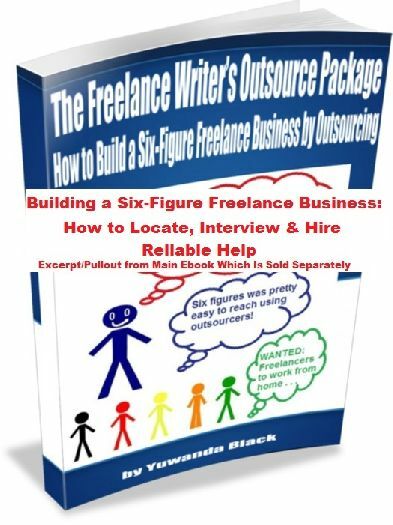 This is an excerpt (a pullout) from the ebook, The Freelance Writer’s Outsource Package: How to Build a Six-Figure Freelance Business by Outsourcing. I’ve been a freelance writer since 1993 and receive questions from others about every aspect of freelance writing. It’s one of the reasons I started InkwellEditorial.com, a niche site about how to start a successful freelance writing career. These really started in earnest when I started doing SEO writing. I wrote an ebook about my successful foray into this niche (How to Make $250+/Day Writing Simple, 500-Word Articles). In it, I detailed how I got so busy within the first couple of months that I had to outsource. More questions came in, so I started a separate blog catering to this niche (SeoWritingJobs.com). This signaled a couple of things to me: i) that many are not only finding success as freelance writers, they’re taking it to the next level and hiring others; and ii) there’s tons of work out there (especially for web/SEO writers) and many are finding it – and outsourcing it. Hence, the need for info on outsourcing more than ever! Following is a detailed question that one freelancer sent in. I have come to the realization that even when I'm swamped with work there is obviously only so much I can accomplish as an individual. I would like to look into outsourcing my work. The main concern I have is how to have faith that a person will do the job with flying colors. I have placed a few craigslist ads . . . so I do have some people I'd like to try. When you first went about hiring people to represent your hard work, did you draw up a contract with them? If so, what kind of issues do you feel is a MUST? The last question I have is how to decide what kind of pay rate for the people I'd be outsourcing to? I can't offer the moon & the stars right off the bat & I don't want to lowball anyone. This ebook will answer all of these questions and more, helping you to build a thriving freelance writing business that ensures you’ll never have to look for a job again – ever. Following is the Table of Contents for the info covered in this pullout, Part II. See the full Table of Contents.